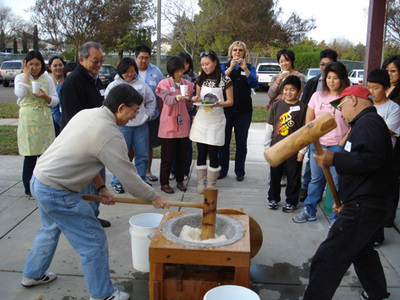 Huge wooden mallets slicing through the air, baseball bats mashing the rice, deft hands patting the rice cakes flat, and 50 hungry mochi makers all tasting the scrumptious treats in a traditional welcome to the New Year at the Florin History Center on December 28th. 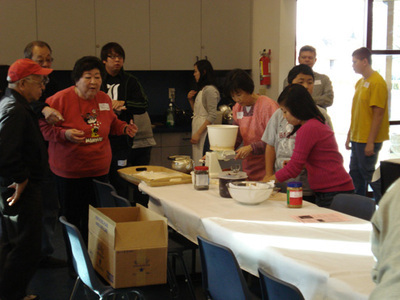 The “Mochi Madness” mochitsuki (sweet sticky rice cake making event) and potluck social was organized by our Florin JACL youth and family programs. “Mochi Madness” presented a unique opportunity to experience a great cultural tradition, bring the community and generations together, and celebrate the New Year in a fun way. More such excellent get-togethers would be welcome. 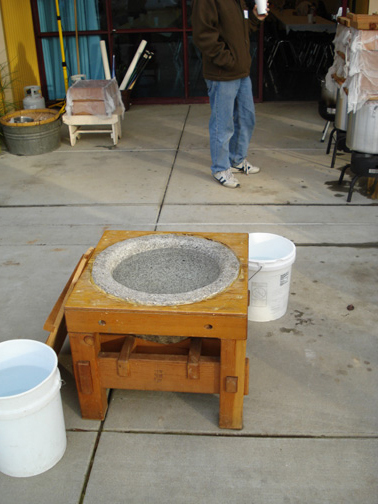 Stan “mochi master” Umeda, in charge of the cooking and pounding, came especially well-prepared with 1930s family usu (granite mortar stone), kine (wooden mallets) for pounding, and seiro (steaming baskets). Experienced and inexperienced mochi-makers, students and elders, all lined up to try their hand with the huge wooden mallets. 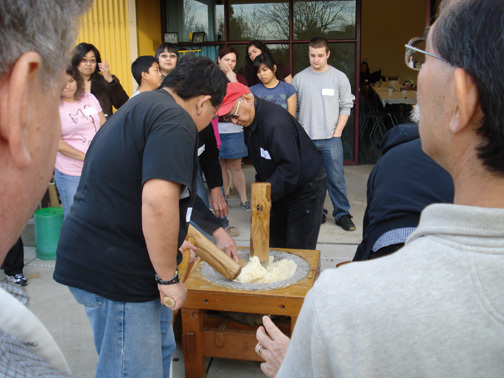 Several seasoned hands swung a pretty “mean” kine including Bob Uyeyama, Sam Morishima, Bobby Horiuchi, and John Nishida III. The college crew of Ben Staley, Jordan Rodriguez, and Larry Nguyen really pitched in all around. 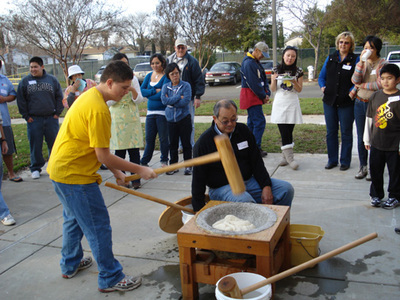 In a uniquely American twist, our group even used baseball bats to first mash the mochi rice together to ready it for the pounding. Some of the younger folk, including Justin Fong, Ricky Uno, and Ben Leaon expertly handled those baseball bats and mallets with a clear aim. 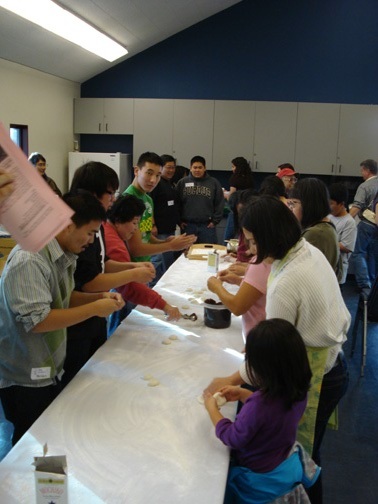 People also learned from our “Mochi Recipes and Tips” handout that mochi is widely popular throughout Asia in Chinese (jin dui), Filipino (babinka), Korean (song paen), Thai (sticky rice with mangoes), and other cuisines. During the event, a young Hmong woman and her grandmother drove by in their car and dropped in. 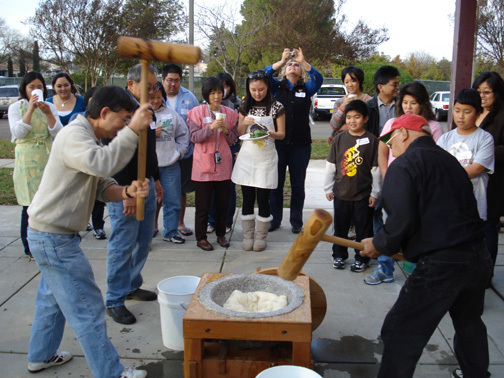 The grandmother recognized the wooden mallets and told us that Hmong people from Southeast Asia also pound mochi the same way. A dedicated crew of mochi cutters and makers lined the flour covered tables. Twila Tomita and Annie Kim Noguchi switched off on the mochi cutting machine, preventing too many singed fingers. Our youngest mochi lover at about age 5, Sakura Yuki, and her mother Kaori shaped dozens of mochi cakes, even peanut butter ones. 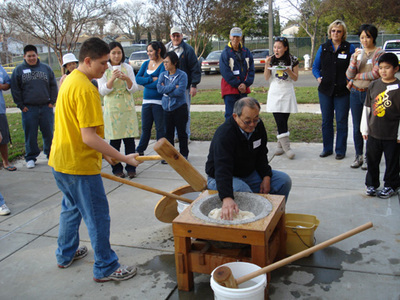 Yuki Nishinaka and her niece Julie jumped right into the flour flying fray. 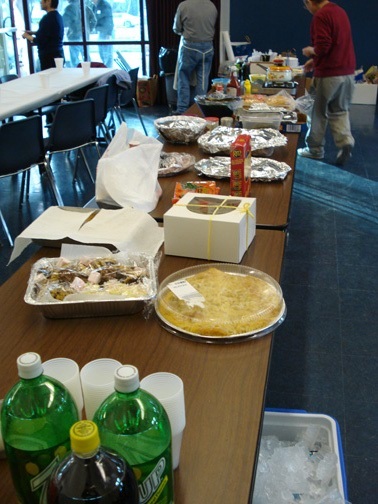 Fumie Shimada was the "chef extraordinaire" along with Sam, her indispensable shopping assistant. Fumie’s daikon oroshi nori (grated radish with mochi wrapped in seasoned seaweed) and traditional ozone New Year’s soup were delicious! The zenzai (sweet red bean soup with mochi) hit the spot, too. 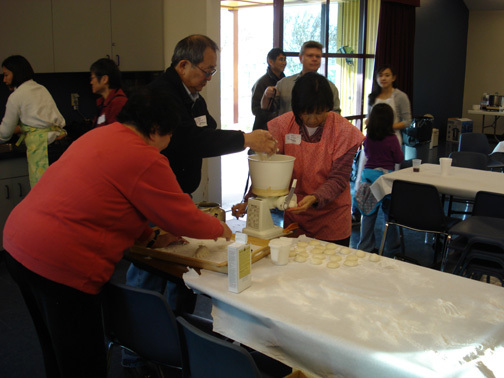 Sampling fresh mochi stuffed with “an” (sweet red bean paste) or dipped in kinako (roasted soy bean flour)/sugar or the ginger/soy sauce/ sugar couldn’t be beat. It was especially good to see some of the Florin JACL students who had been away at college back home for the holiday break: Sondra Morishima (NYU), Erik Nishida (Purdue), Michelle Fong (U.C. Davis), Ben Staley (San Jose State), Annie Kim Noguchi (U.C. 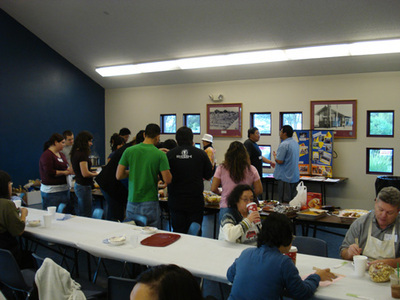 Berkeley), and Beth Uno (UCLA) all pitched in. Meeting members of the San Francisco Asian American Theater Company (Bobby Horiuchi, Helen Plenert, Art and Justine Lai) was a treat. I remember seeing several of Art’s excellent performances as Sam Shikaze, a Nisei Sam Spade, in the hit play Yellow Fever. 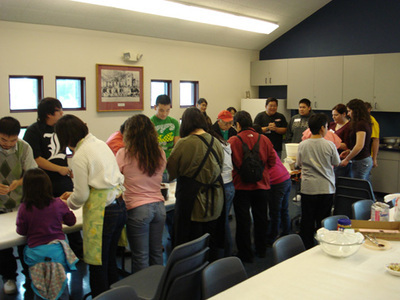 The Mochi Madness recalled thoughts of family and community for many. 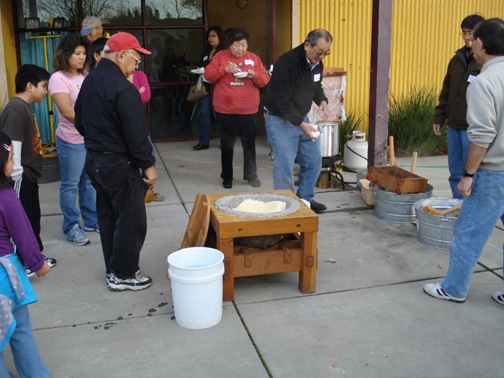 Utako Kimura shared that it brought back many wonderful memories of family mochitsuki on the farm. 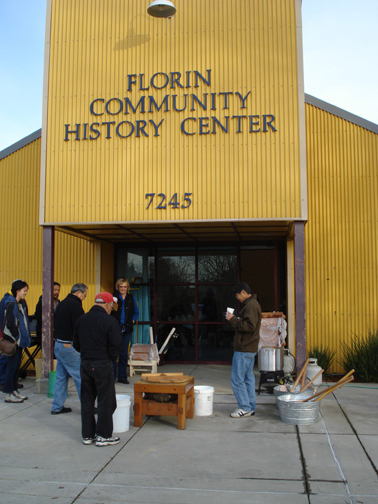 I couldn’t agree more with Heidi Sakazaki when she said that after eating Florin's mochi, there is no other that comes even close. Special acknowledgement goes to our dedicated Mochi Madness planners Stan Umeda, Fumie Shimada, Terry Nishizaki, Twila Tomita, and Andy Noguchi. 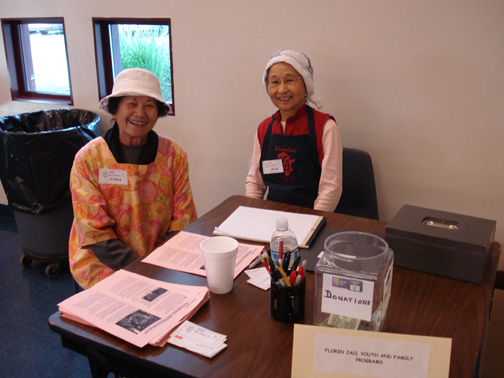 Other volunteers who really came through included Sam & Howard Shimada, Utako Kimura, Heidi Sakazaki, Bob Uyeyama, Kazuyo Morishita, Annie Kim Noguchi, Sam and May Morishima, Mike Staley, Beth Uno, Michelle Fong, Kevin Nakano, and John Onate.